The fourth day will be an unusual meeting in which science, art, history and healthy eating will merge into one unforgettable experience. The day will be articulated in a lively scientific session followed by a tour through the lands that hosted one of the oldest and most fascinating civilization of the past and from which scents and flavors, that make unique Italian food and wines in the world, originate. Villa Paolina represents one of the most relevant park of the Umbria region, due to the avenues and historic gardens that includes, and the variety, the development and the vegetation of the plant species present. Known in the sixteenth and seventeenth centuries as the Villa of the Seven Cardinals, the complex assumes the connotations of a true homely mansion around 1706 by Giovan Battista Gualtiero, son of Stanislao (1628-79) Marquis of Corniolo, who lives there with his wife, noblewoman Giulia Staccoli of Urbino. The Gualtiero era ended immediately after the Unity of Italy: in 1874 Villa del Corniolo was alienated and passed into the hands of the marquis Viti Mariani. Since then, the villa will be called Villa Paolina, in honor of the new owner’s wife, the marquis Paolina. During the twentieth century, the Villa becomes property of the Province of Terni that for a long time has granted it, under a Convention, to the National Research Council, before as a headquarters of the Institute for Agroforestry and currently, after a restructuring within the CNR, of the Institute of Agro-Food and Forestry Biology (IBAF). The IBAF carries out experiments and research into the branches of Ecophysiology, plant ecology, genetics, forestry and forestry research, some applications in the agro-food industry and food certification. The networking day will start at Villa Paolina, which will host a lively “think tank” where participants will be involved to discuss on new biosensing technology developments, providing any kind of information, ideas, and advice. Located in the Umbria region, the green heart of Italy, Orvieto is a very ancient city situated on the flat summit of a large butte of volcanic tuff. 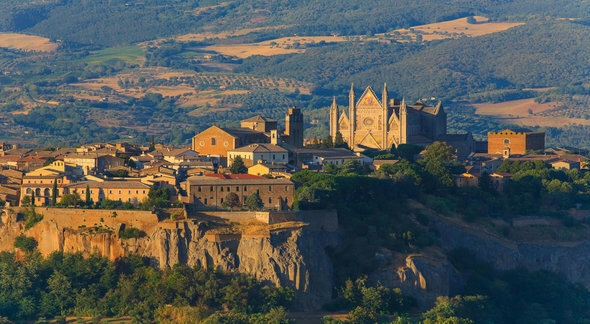 Inhabited since the Iron Age, Orvieto was a major centre of Etruscan civilization known under the name of “Velzna” (latinized as “Volsinii”). Located in a virtually inaccessible area, equipped with powerful fortifications, the ancient Velzna was a very rich city, which controlled the river communications between Etruria and Rome. Described as “Caput Etruriae” (“Capital of Etruria”) by Valerius Maximus (first century AD), and “Oppidum Tuscorum opulentissimum” (“Rich fortified city of the Etruscans”) by Pliny the Elder (23-79 AD), Orvieto (whose current name of medieval origin derives from the latin “Urbs Vetus” or “Old Town”) offers a lot of itineraries through which visitors can examine the history of this city: from Etruscan constructions (Etruscan temple of Belvedere, the Etruscan Necropolis of the Crocifisso del Tufo, the Etruscan wall and the Etruscan well), to the underground of Orvieto, full of pits and caves of Etruscan and Medieval periods, the Saint Patrick’s well, the Anello della Rupe path, and the Cathedral. 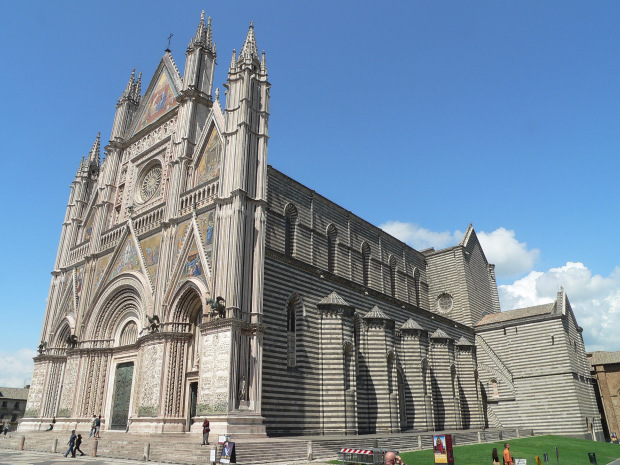 The Orvieto Cathedral is widely considered the most glorious example of Italian Gothic. It is a large 14th-century Roman Catholic cathedral dedicated to the Assumption of the Virgin Mary. The building was constructed under the orders of Pope Urban IV to commemorate and provide a suitable home for the Corporal of Bolsena, a miracle which is said to have occurred in 1263 in the nearby town of Bolsena, when a travelling priest who had doubts about the truth of transubstantiation found that his host was bleeding so much that it stained the altar cloth. The cloth is now stored in the Chapel of the Corporal inside the cathedral. Situated in a position dominating the town of Orvieto the cathedral’s façade is a classic piece of religious construction, containing elements of design from the 14th to the 20th century, while inside resides some of the best Italian painters of the period. The MUVIS, Museo del Vino e delle Scienze Agroalimentari (Museum of Wine and Agro-Food Sciences), housed inside the monumental Vaselli’s Cellars, is an anthropological museum that aims to return the thousand faces of the territory and offers the visitor a journey, both real and symbolic, in the depths of the earth.